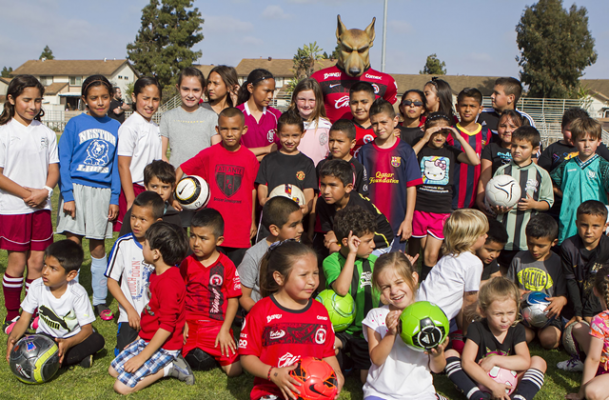 SAN DIEGO –Club Tijuana Xoloitzcuintles de Caliente held day of soccer activities in San Diego Saturday March 22 that included an exhibition match and some free clinics for young athletes in the community at Southwest High School. Club Tijuana’s Reserves (Fuerzas Basicas) team crossed the border to play in a friendly match against the California Interscholastic Federation State Champion Southwest High School Raiders boys varsity team. The Raiders scored in each half to beat the Xoloitzcuintles reserves 2-1 in a rare meeting between youth teams. More than 300 fans showed up to witness the tightly contested match. Fans also got a chance to have their young athletes participate in a series of free soccer clinics held right after the friendly match between Club Tijuana’s reserves and Southwest High. More than 100 kids took part in the free clinic that included local children from the local AYSO chapter. Children in the Under-6, Under-8 and Under-10 categories went through drills and fun activities instructed by Club Tijuana Under-17 coach Ignacio Ruvalcaba and his Xolos Academy FC Chula Vista staff and some of his players. Xolos Academy FC Administrating Director Ramon Vazquez talked about the day’s activities and its purpose within the community. Vazquez talked about the opportunity children have to be part of a soccer program that is directly associated by a professional team, in this case, Club Tijuana. Jose Sanchez, defender on Club Tijuana’s Under-17 squad talked about having the chance to volunteer and help teach during the free clinics. Pablo Flores, the Club Tijuana Under-17 goalkeeper, talked about what it meant to him to be an instructor at the clinic. Families were able to register to the Xolos Academy FC during Saturday’s events and registration will continue for the 2014-2015 season. Those interested can register during weekly practices at Hilltop High in Chula Vista or at the academy designated office at 861 Harold Place Suite 206 Chula Vista, CA 91914. Under-8 to Under-11 5:30 to 7 p.m.